The Velocity Ultra is a performance driven wetsuit that features the PROGRESSIVE FULL-STRETCH construction of the popular Velocity, with the advancement of Ultrawarmth Celliant® Infrared Technology. Our greatest innovations in design and development together for longer, more comfortable dives. Our proprietary combination of three different full-stretch material types, which we call PROGRESSIVE FULL-STRETCH construction (PFS), makes this one of the highest performing mid-priced suits available. We start with BARE-FIT, the foundation of every BARE suit, which uses ergonomic design and intricate shaping patterns with articulated arms and legs. Then we highlight areas of the suit where flexibility and abrasion resistance are essential, and incorporate special full-stretch fabrics to maximize performance in these key areas. PFS gives the Velocity Ultra Series a fit and feel unlike any other. What makes the Velocity Ultra Series truly special, is that it’s the only mid-priced dive suit to feature the thermal-activated performance of Celliant® Infrared Technology. Using minerals woven into the fabric of the suit, Celliant® turns wasted body heat into infrared energy, reflecting it back to your body. 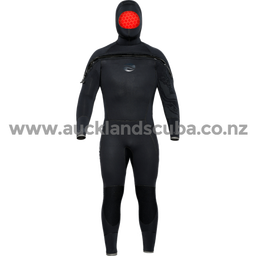 This results in increased warmth, faster recovery times, and greater stamina for longer, more comfortable dives.